Uganda’s major international gateway is Entebbe International Airport, which sits roughly 25 miles south of Uganda’s capital Kampala. Budget travel in Uganda usually costs between $25 and $35. 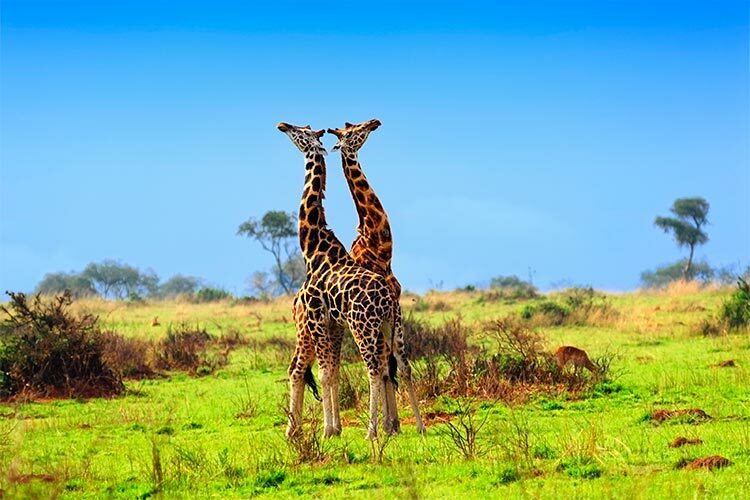 The high season for tourism in Uganda coincides occurs at the dry season, when wildlife safaris are at their peak. This happens from January through March and again from June through October. Temperatures throughout the year stay between 18 and 28˚C (65-82˚F). Crafts, masks and statuettes are commonly found souvenirs in Uganda. The lush, green country of Uganda is a landlocked African country bordered by Kenya, the DRC, South Sudan, Rwanda and Tanzania. The country is found in the Africa Great Lakes region and features numerous bodies of water, including the enormous Lake Victoria. Inland Uganda is largely composed of thick jungle or marshes, though some savannah and mountains do exist. The landscape and the animals which live there play a huge role in Uganda’s tourist sector. 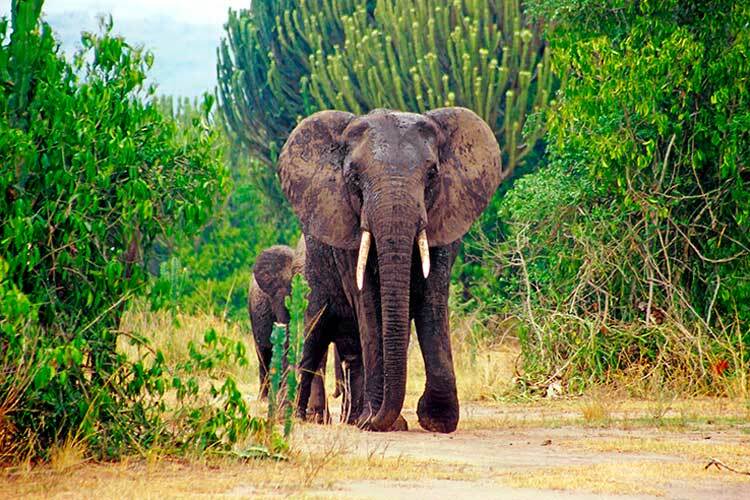 In fact, recent estimates suggest that more than 80% of tourists in Uganda are visiting the country primarily for the wildlife. The country’s most popular attraction is trekking through Bwindi Impenetrable National Park, home to more than half of the world’s remaining wild mountain gorillas. Early Ugandan history is similar to its neighbours. Early on, the country was home to a variety of native peoples, who were primarily hunter-gatherers or nomadic. However, this changed with the arrival of the Bantu from Central Africa. The Bantu were skilled in metallurgy and agriculture, which allowed them to develop an expansive kingdom throughout Africa. Though several other immigrant groups moved into Uganda at some point or another, the Bantu were the predominant force in the region for many centuries. Other groups in the area included the Luo from Kenya and Arabic traders who had moved inland. In the 1860s, British explorers began coming to Uganda, mostly in search of the source of the Nile River. However, the region soon became a popular destination for Christian missionaries. In 1888, Great Britain assimilated Uganda into its colonial territories and placed it under the control of the British East Africa Company. During British reign, the famous Uganda Railway was constructed. Unfortunately, the British also brought along diseases, and in the early 1900s an outbreak of the Black Plague killed a huge portion of the country’s native residents. In 1914, the British added more land and cities to the country, and for the first time the area was named Uganda. The country was given its independence in 1962. During the 1960s, Uganda was ruled by an unstable democracy, which was replaced by a military dictatorship in 1971 under the leadership of Idi Amin. His reign was marked by widespread death and genocide, as well as general degradation of the economy. Amin was displaced in 1979 and replaced by numerous short lived presidents. Since 1986, Yoweri Museveni has been in control. Though his reign initially looked promising, it has since been revealed that his regime has committed numerous humans rights violations during Uganda’s lengthy civil war with the Lord’s Resistance Army, led by Joseph Kony. Even today, Uganda struggles economically and politically, though it has become substantially more stable and open to tourism since the turn of the centre. As we’ve already alluded to, ecotourism, particularly expeditions to see mountain gorillas, makes up the majority of Uganda’s tourist industry. Bwindi Impenetrable National Park is by far the most popular place to see the gorillas. There are several groups of gorillas in the park, some of which live within 15 minutes of the campsite. Other groups take a day or two of hiking through thick forest to reach. Because of the popularity of this activity, the locations of the gorillas are relatively well known, and it’s rare that one won’t see at least some gorillas in the wild. The park is also home to 119 other mammal species, several dozen types of reptiles, and countless plants, birds and insects. Kampala is the largest city in Uganda, and really the only settlement currently large enough to qualify as a full sized city by international standards. Because of this, Kampala is home to numerous historic and cultural attractions. The Uganda Museum, the country’s national museum, is an example of one such attractions. Another celebrated attraction is the Kasubi Tombs, which are the final resting place of royalty of Buganda, a powerful 14th century kingdom. Kampala sits near the headwaters of the Nile River, which makes boating, kayaking and fishing another popular activity for tourists. Lake Bunyonyi is found in southwestern Uganda, near the border with Rwanda. The lake is well known for its bright blue water and numerous islands. What’s more, the surrounded landscape is terraced in a unique and gorgeous manner. 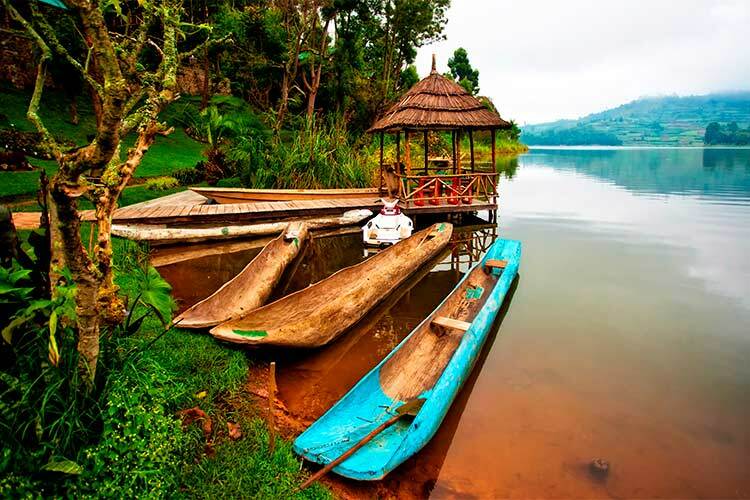 Lake Bunyonyi features 29 islands. Bushara Island has been developed specifically for tourists, which the purpose of reinvesting profit from the tourist industry into humanitarian works around Bunyonyi. This island features luxury resorts, campgrounds and boat rentals. All 29 islands in Lake Bunyonyi are world class birdwatching locations, featuring hundreds of different species throughout the year. 1) Relax on the shores of Lake Bunyonyi, then take a boat out to the luxury campgrounds on Bushara Island. Alternatively, head over to Punishment Island, Akampene. Here, unwed pregnant women were marooned as a warning to other women not to procreate before marriage. While in the Lake Bunyonyi area, don’t forget to be constantly on the lookout for rare and colourful birds. 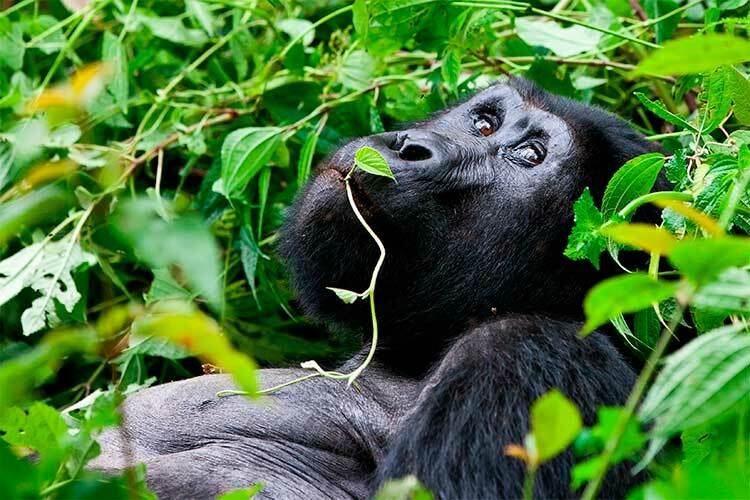 2) Go gorilla trekking in Bwindi Impenetrable National Park. You’ll need to spend a night at one of the two campgrounds, then traverse through difficult paths through the jungle for anywhere from fifteen minutes to an entire day. However, seeing the rare and majestic mountain gorillas makes for quite the reward. 3) Queen Elizabeth National Park is Uganda’s most visited national park for good reason. The park is most famous for its numerous volcanos, which lend a dramatic edge to the landscape. They also provide an area for crater lakes. Queen Elizabeth National Park is also home to numerous animals, including hippos, elephants, lions and chimps. 4) When in Kampala, be sure to see the fittingly titled national museum, the Uganda Museum. What’s more, you’ll want to visit the Kasubi Tomb, a very popular and fascinating royal burial ground. 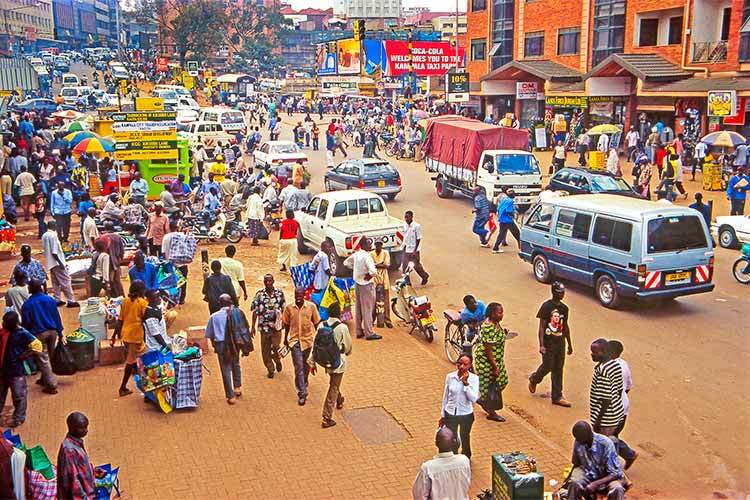 Kampala also features numerous dining and shopping options, especially in the Owino Market. 5) The coastal city of Entebbe has become a popular tourist destination, due primarily to its relaxed environment and location on the banks of Lake Victoria. Entebbe is the home of the Ugandan president, who resides at the State House. The city is also home to an extensive botanical garden and a zoo. 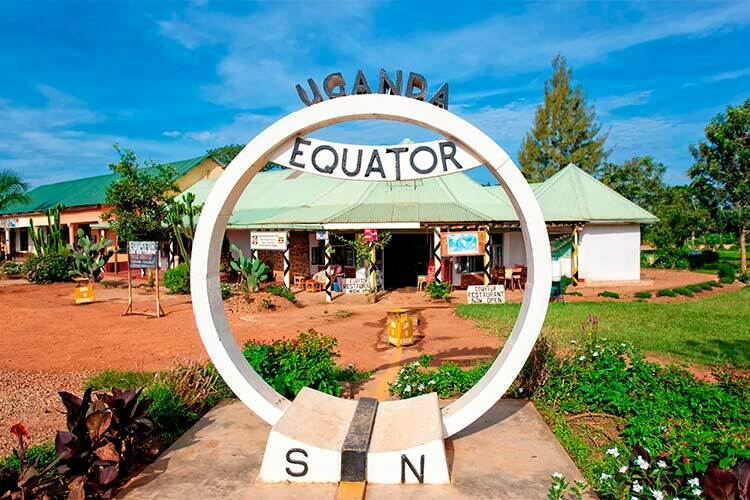 6) Jinja is located on the banks of the headwaters of the Nile River. For this reason, the location is best known as the source of the Nile River, which is commemorated by some gardens and a statue of Ghandi. The area is also a prime location for white water kayaking. Jinja is also home to Nile Breweries, one of the most popular distilleries in East Africa. 7) Murchinson Falls National Park is found in northwestern Uganda and has historically been a popular attraction. Unfortunately, much of the wildlife was massacred by poachers during Idi Amin’s dictatorship. However, the park is slowly recovering. 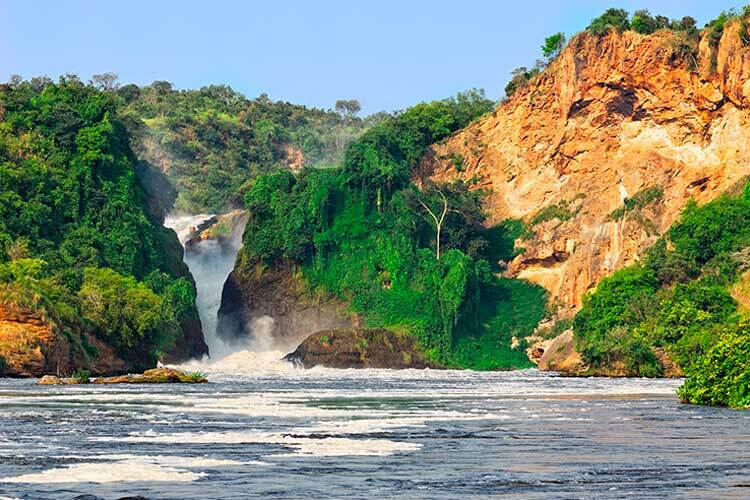 Its most famous site is undoubtedly Murchinson Falls, where the water from the Nile is forced into a small gorge before emptying out at an incredibly high speed.